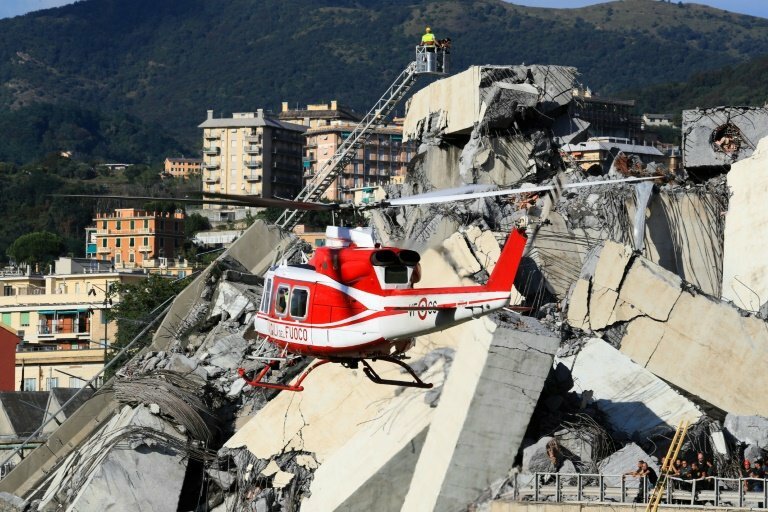 A month after Genoa's Morandi Bridge collapse killed 43 people, the port city is tending to its wounds and those left homeless by the disaster are turning a brave face to the future. "I was asleep at home that day because I work at night. At 11:36 am I heard a huge noise," said Giovanni Genco, who had to flee his home with his 16-year-old daughter. "I would never have imagined that it was the bridge. It was raining, there was a storm, I thought it was thunder or maybe an earthquake." Genco, along with his wife, daughter and parents-in-law, was among the hundreds who were evacuated from the at-risk "red zone" under the fragile remains of the bridge. He was allowed to return once to their home to collect some effects and it will soon be demolished. "If I go back, I'll cry, for sure," says Genco, tears welling in his eyes. He says Autostrade di Italia, which managed the bridge, "destroyed 20 years of our life" because their home was everything to them. The 50-year-old steel worker hopes to rent an apartment before the end of the month because "it's hard living in a hotel" in the neighbourhood. "I grew up here, I have my friends here, my football club, everything. I've been in Genoa for 30 years and I've lived here for 30 years, this is my life." He meets with other evacuees under tents on a nearby street, there are a few chairs, tables, a fridge. They eat together and talk, maintain their relationships. "We all go to see the psychologist (provided by the authorities)," said Liliana Morando, 90. "Because things aren't OK. They make us talk, they tell us to cry, it's an outlet." Morando and her two daughter are staying with friends. 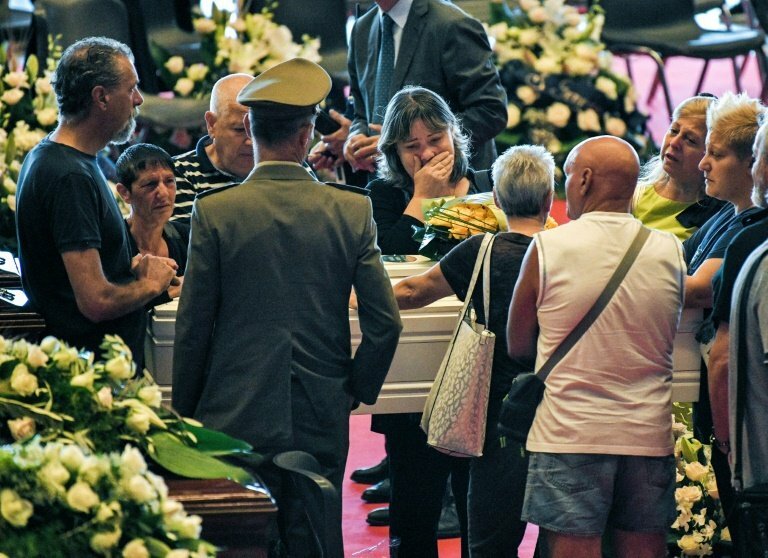 "We're waiting for them to give us somewhere temporary" before Autostrade di Italia gives us a new home, she said. Immediately after the disaster, which left hundreds injured, survivors felt "disbelief and desperation", says Selene Parisi, who volunteered to help the evacuees. "Now I think a bit of anger begins, a lot of tiredness." Parisi lost two members of her family in the tragedy and would rather be here than at home. "The building site is really loud," she says. "Nothing here will ever be the same again." The meeting tent is "like a family, a social network that takes us in its arms," she said. "We will stay here until we've all got what we're owed." City residents held a minute's silence while church bells tolled at precisely 11:36 am (0936 GMT) on Friday. They were due to gather for a commemoration at 5:30 pm. 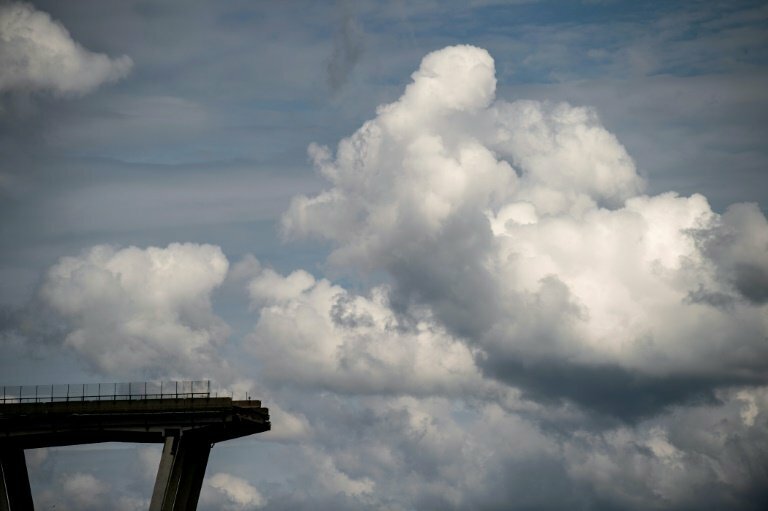 Work on a new bridge will begin in the coming months, likely according to plans drawn up by world famous architect and Genoa native Renzo Piano and paid for by Autostrade di Italia. In the meantime, the city's traffic has had to be completely reorganised since the vital traffic artery collapsed. There are a few jams but fears of a paralysed city have not materialised. Nevertheless, some businesses near the "red zone" are suffering because of the difficult access. "We're on the brink, very few people come now," said Giuseppe Celestri, 64, who works at a building supplies shop near the danger zone. "I'm OK, I'm nearly retired, but we have two young people with families." Genoa aquarium, Europe's largest, saw attendance drop by 50 percent immediately after the August 14 disaster, before it picked up again, said director Giorgio Bertolina. "Genoa is not as isolated as people might think," he said. "Having less commercial traffic on some roads because trucks can't drive during the day at the moment actually makes access to the historic centre and aquarium easier." "The city needs to look forward," he added. "I am not saying it should forget the past, but look forward and use this in some way... as an opportunity to give the city a new beginning."